4 2 Be the first to write a review! 3-layer ventilation system that wicks away perspiration and body heat keeping you cool and dry during hot flashes! Stay cool and dry during hot flashes! Thousands of resilient fibers act as independent springs to keep air flow channels open. 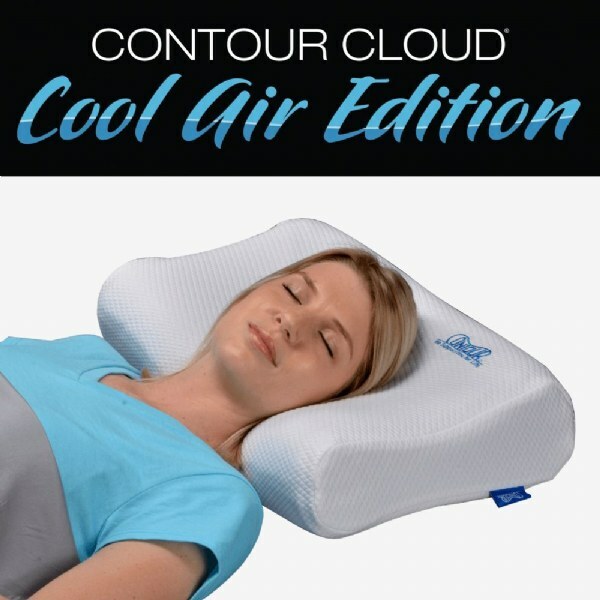 Contour Cloud Cool Air Edition Pillow is uniquely designed with a 3-layer ventilation system that wicks away perspiration and body heat keeping you cool and dry during hot flashes and night sweats! Imagine resting your head on a cool, cushiony cloud of air! Contour&apos;s 3-layer design keeps back and side sleepers cool and dry with a ventilated memory foam core, a middle layer of cooling, air-circulating mesh and a soft, breathable cover that wicks away moisture! The pillow&apos;s core is 100% ventilated memory foam to prevent the pillow from retaining heat. Next, the Air Mesh Layer is 99% air, for cloudlike sleeping comfort. The soft mesh layer prevents heat and humidity build up. The quilted, breathable pillow cover is custom fit for all night sleeping comfort. All three layers work in unison to provide air circulation all night long keeping you cool and dry. For Maximum Cooling - Use Pillow in Your Own Pillow Case.